BLC Online is pleased to present Living Biblical Hebrew: Jonah (beta). This course is packed with new educational material for an even more effective learning experience delivered online, right to your students. It is designed to follow BLC’s Living Biblical Hebrew: Foundations. Teachers electing to use this online curriculum will gain access to additional assessments with the ability to track grades online and, to the available portions of the Teacher’s Manual as it is developed. To request a virtual desk copy and discuss pricing, contact us at support@biblicallanguagecenter.com. No time to write? Click here and send your email. We'll contact you. you about your interest in Living Biblical Hebrew: Jonah. Avail yourself of the benefits of this online product by using it in your classes instead of a print textbook by requesting a dedicated course arrangement. This will include all the online course content, plus teacher’s manual and gradebook features, and be accessible by you and your students only. 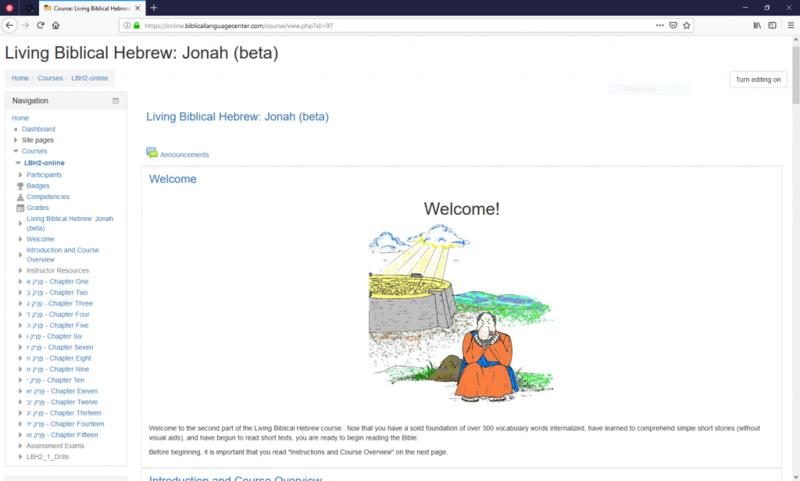 Instead of purchasing the textbook, students will purchase access to Living Biblical Hebrew: Jonah (beta) with the full suite of features and resources described above. Track your students’ progress and export their results on all self-graded homework and quizzes, and more. 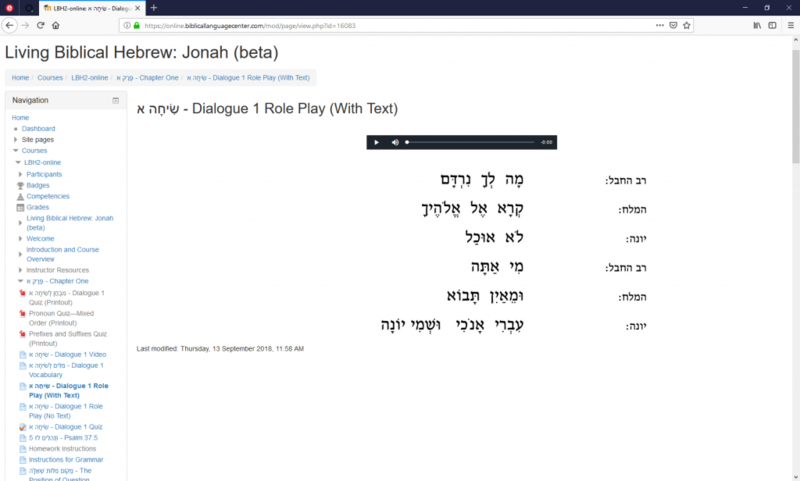 Living Biblical Hebrew: Jonah (beta) is designed to expose students to the language in meaningful, communicative contexts, speeding up the internalization of biblical Hebrew. Unlike recordings of vocabulary lists and verb paradigms, and unlike written grammar drills that simply ask you to fill out specific forms, which are all unnatural communication contexts, Living Biblical Hebrew’s content keeps you immersed in the language in real communicative contexts, providing the comprehensible input necessary for reaching reading fluency. This invaluable material is built around engaging dialogues based on the biblical text of Jonah, and includes almost 15 hours of audio, and dozens of written drills and assessments (detailed below), all in biblical Hebrew. Because we know that aural exposure to the language is absolutely necessary for the internalization of biblical Hebrew and fluent reading, the 300-plus audio tracks are an integral part of our curriculum, not an optional extra at an additional cost. Jonah also contains a full explanation of Biblical Hebrew’s morphology and syntax. Further, there are extensive footnotes throughout that deal with the development of the language and the stylistic functions of Biblical Hebrew structures, many of which are typically only covered in advanced grammar books. Dialogue Videos: In addition to the audio of each dialogue, there are ten videos demonstrating the performance of the memorization dialogues. Grammar Drills: Audio and written grammar drills, entirely in biblical Hebrew, used for homework to raise your language awareness in meaningful contexts. Further, these drills are self-grading, allowing you to work through the material until you can comprehend it fully and answer each question correctly, all in Hebrew. Assessment Reading Questions: Self-grading reading quizzes on both the Jonah portions and the Vocabulary Stories testing your reading comprehension via multiple choice questions in biblical Hebrew. 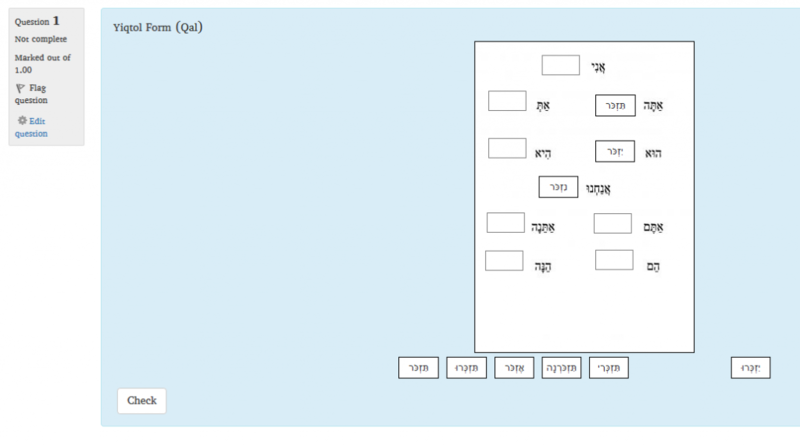 Assessment Quizzes: At regular intervals there are self-graded assessment quizzes that test, in biblical Hebrew, your progress in the language.